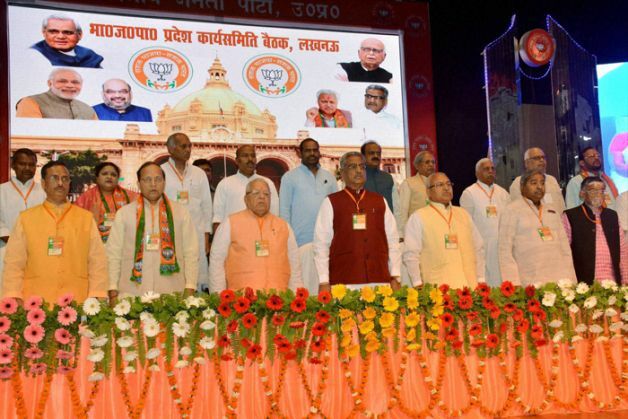 After months of seeming inactivity and backroom planning, the Bharatiya Janata Party finally seems to be taking concrete steps towards preparing for the 2017 Assembly elections in Uttar Pradesh. The party sounded the bugle for 'Mission UP' in a meeting of its state working committee on Friday. Its poll strategy is likely to be centred around Dalits and Modi's charisma. The working committee also decided to highlight the Modi government's plans to promote five places connected to Dr BR Ambedkar as 'Panch teerth' (five pilgrimages). These places include the birthplace of Ambedkar, his residence during his higher education in London, his place of study in Nagpur, Chaitya Bhoomi at Dadar Chowpatty in Mumbai and Mahaparinirvan Sthali in New Delhi. Exhorting party workers to go into the battle like 'soldiers', the working committee leaders came down heavily on the Samajwadi Party, the Bahujan Samaj Party, and the Congress. "We will work hard for the elections. Our party will form the next government in the state. Time will tell, we will win these elections," said party national vice-president and state in-charge Om Mathur. "The working committee also passed resolutions against the deteriorating law-and-order situation, farmer distress, rising unemployment, corruption and crime against women in the state." The meeting started with the slogan of "Bharat Mata Ki Jai". The slogan was also raised at regular intervals during the leaders' speeches. Working committee members unequivocally supported its chanting. Several speakers denounced political leaders who have opposed this slogan, and stated there should be no debate over its validity. They were of the view that it is an old slogan signifying patriotism and infuses energy among the masses. The recent debate on nationalism also came up for discussion during the meeting. Party leaders and workers were asked to oppose the 'anti-national' forces in an aggressive manner. "BJP is a party that works on the policies of nationalism, inclusive development, and Antyodaya (serving the last person in the queue)," read one of the resolutions passed during the meeting. "The opposition parties are trying to divert attention from the real issues by raking up the debate on nationalism. It is an attempt to destabilise the Modi government." State unit president Laxmikant Bajpai said: "We must expose the failures of the state government through the media to dent its image. The rampant corruption within the government and its administrative machinery needs to be brought to the public's attention. No effort should be spared to take the Modi government's achievements to the people." The working committee leaders showered praise on Modi. "India is now being taken seriously at the United Nations because of Modi. The country is on its way to redeeming its status of 'Vishwa Guru'. The celebration of the World Yoga Day is the first step in this direction. The year of 2017 will belong to BJP, if we take inspiration from the Prime Minister," Mathur said while inaugurating the meeting. Mathur also claimed that 65 lakh people have voluntarily given up LPG subsidy on Modi's appeal, and this would ensure new gas connections to around 5 crore poor families. Senior state BJP leader and Union Minister Kalraj Mishra trained his guns at BSP. "Mayawati had promised to put Mulayam Singh and Amar Singh behind bars on coming to power. However, she did nothing to fulfill this promise. Similarly, Samajwadi Party backtracked from its poll promise to hold Mayawati and her officials accountable for corruption. Both parties are in collusion over the issue of corruption," he alleged. Bajpai informed workers that the Modi government will allocate Rs 80 lakh to each village for development. According to him, the Central government has also decided to give Rs 21 crore to every block for the same purpose. He dismissed Chief Minister Akhilesh Yadav's allegations that the Modi government is not giving the state its due share of the money. "Where did the Rs 2,801 crore released by the Union government for the farmers of the state go?" he asked. Bajpai also criticised the state government for the worsening law-and-order situation in the state. Accusing the incumbent government of turning Uttar Pradesh into the "dumping ground of corpses", he claimed that the state has witnessed 12,198 murders, 2,930 rapes, 6,015 robberies and 1,232 incidents kidnappings during the Samajwadi Party's rule. Bajpai also raised the issue of Dalit atrocities in Uttar Pradesh. He alleged that Mayawati only pretends to be the well-wisher of Dalits. "We are pained at the suicide of Dalit student Rohith Vemula in Hyderabad. But neither Mayawati nor her deputies Nasimuddin Siddiqui and Swami Prasad Maurya ever visited the Dalit families who suffered persecution," he said. West Indies' hammers versus England's scalpels: who will win the WT20 Final?